William Ewart Gladstone (1809-1898), four times Queen Victoria's prime minister, was born, as Oscar Wilde would have described it, to the purple of commerce. His father owned mines in Wales, factories in Lancashire and sugar plantations in Jamaica. 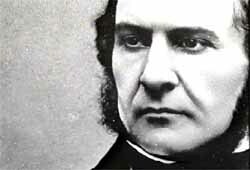 A brilliant student and debater at Oxford, and with powerful family political connections, Gladstone was elected to a seat in the House of Commons from at twenty-three. Except for a few years, he was an ornament of the Commons the rest of his long life. When Wilde wrote of the importance of being earnest, implying that earnestness, or at least the suggestion that one was in earnest, was one of the hallmarks of Victorian life, he might have been thinking of such eminences as Gladstone. From the start it was his political keynote as speaker and writer. As radical politician John Bright once boasted of Gladstone in a speech at Birmingham, "Who equals him in earnestness." Two years into his parliamentary career as a Conservative he was made a junior lord of the Treasury, and the next year undersecretary for the Colonies. He would hold other sub-cabinet offices while becoming recognized as a master of debate, with one of his leading adversaries Benjamin Disraeli. Their mutual dislike, and rivalry for office, energized English politics for more than forty years, Gladstone leaving their party to join the new Liberals formed from the Whigs and free-trade Tories. As a result when Disraeli, after an election defeat, resigned as chancellor of the Exchequer, he refused to relinquish his Cabinet robes when his place was taken by Gladstone. While their own exchanges of retorts were memorable, they can best be characterized by the appeal of Viscount Palmerston, when prime minister, to his chief point-man on the House of Commons floor: "We need a great Gun to reply to Disraeli. Will you follow him?" 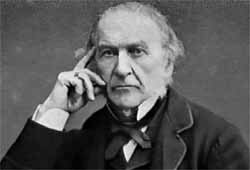 Disraeli once claimed paradoxically about Gladstone, "He has not a single redeeming defect." (Similarly, his successor as prime minister, Lord Rosebery, wrote, "The defects of his strengths grow on him.") Their differences were dramatic, Disraeli was flamboyant in dress and style, went through the necessary forms of religious practice, but no more, and made no secret of his attraction to aristocratic beauties. Gladstone was austere, obsessed by High Church theology and disputation, and was obsessed (despite marriage and many children) by low--but pretty--ladies of the evening, whom he would stalk, confront, and urge to reform their ways, afterwards returning home in a frisson of excitement to secretly whip himself. His diaries record decades of this peculiar Victorian-era practice, known to his colleagues (and even to the Queen) but kept from an adoring public which considered him a paragon of the ethical life. The two rivals also disagreed on Britain's imperial destiny, Gladstone seeing colonies as more burden than boon, and attempting to disengage from empire and its expense. For Americans, it is Gladstone's position in the Civil War that may lodge in the memory more than his significance in English public life. Although he considered himself hostile to the institution of slavery, his father had held slaves in Jamaica until Britain made that illegal, and early in the war in North America he was outspokenly pro-South, possibly because he deplored the impact of the Union blockade on cotton mills in Lancashire, where there was widespread unemployment. It was clear to him, he charged in a speech, that "the progress of the Confederate Arms" was such that if it continued successfully, the Confederacy "with something like justice . . . might ask of us prompt recognition." But first he would have his government make "a friendly effort to induce the North to recede." Although he claimed that mediating the war to the South's advantage might appear to be interfering for English economic interests rather than in the "general interests of humanity and peace," he saw the North's attempt to keep the South as "thoroughly purposeless . . . , since it has long been (I think) clear enough that Secession is virtually an established fact, & that Jeff. Davis & his comrades have made a nation." However he cloaked such statements in humanitarian and ethical and anti-colonialist terms, he had made with such statements, later repudiated, a reputation among Americans in the Union that would make it difficult for him to carry on good relations later as prime minister with the reunited United States. As a Liberal he supported and often introduced social and educational reforms, sometimes stepping out ahead of his party, and became a skilled manager of budgets although he was known primarily for refusing to spend any more than the minimum necessary on anything. Forceful on the floor of the House, he became its Liberal leader in the 1860s, and succeeded Disraeli as prime minister in 1869 and again in 1880, the latter after a bitter campaign on the "Eastern Question" in which he attacked Disraeli and the Tories for being soft on Turkish atrocities against Christians. As one Member of Parliament, Henry Labouchere, put it, "I don't object to Gladstone always having the ace of trumps up his sleeve, but merely to his belief that the Almighty put it there." To his foreign secretary, Disraeli complained, in agitation, "Posterity will do justice to that unprincipled maniac Gladstone-[an] extraordinary mixture of envy, vindictiveness, hypocrisy, and superstition-whether Prime Minister, or Leader of Opposition, whether preaching, praying, speechifying or scribbling-never a gentleman!" But Gladstone was never interested in being a gentleman, and even turned down an earldom, the usual reward offered an outgoing prime minister. Between the two Disraeli governments he pushed through, in 1870, the first bill establishing a national system of public education. He also introduced a measure to broaden public and university education in Ireland, but, perversely, Irish Catholics opposed it as not going far enough. Gladstone seemed always beset by problems involving Ireland, which was still treated like a colonial territory late in the century, and when he tried push through legislation for Home Rule for Ireland-a form of semi-independence-his party split on the issue and allowed the Conservatives back into power. Still, Gladstone was returned to office in 1886 and again in 1892, his last residence at 10 Downing Street abbreviated the next year when the House of Lords rejected a Home Rule Bill he had struggled to carry through the Commons, and he resigned. Then in his middle eighties, his vision and hearing failing, he retired to his estate and vast library at Hawarden, near Liverpool, his birthplace. Victoria refused all but the most perfunctory farewell to the old statesman, having never liked him, his predilections, and his policies. "He speaks to Me," she once said, "as if I was a public meeting." To her eldest daughter, Vicky, she called him a "very arrogant, tyrannical & obstinate [man] with no knowledge of the World or of human nature. Papa felt this strongly. Then he was a fanatic in religion. All this and much more . . . led him to make a very dangerous & unsatisfactory Premier." 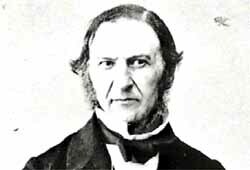 When Gladstone died at Hawarden on May 19, 1898, he left behind not only a lengthy and significant legislative record, largely justifying his claim, "I will back the masses against the classes." He also left a vast body of writing, largely on religious and political issues, and on his beloved Roman and Greek classics, all now unread. (Winston Churchill once quipped, "Mr. Gladstone read Homer for fun, which I thought served him right.") He was buried with great ceremony at Westminster Abbey. To the Queen's pique, the Prince of Wales and his son George, the future George V, were among the pallbearers.